Dental implants are a means to replace missing teeth. They are titanium restorations, which are supported within your jawbone bone. Once a dental implant has integrated with the bone, it is then strong enough to support a crown, bridge or denture. Dental implants are permanent and are self-supporting, so are not dependent on adjacent teeth for their support, unlike bridges and some dentures. Our specialist periodontist will assess the area to ensure enough bone is present to place the dental implant. To achieve an accurate assessment of the jawbone, patients are often recommended to have a CBCT scan, which provides precise 3-dimensional data and images of your jaw. In the absence of enough bone, our periodontist can graft bone into the desired area to create sufficient volume of bone to accommodate a dental implant. 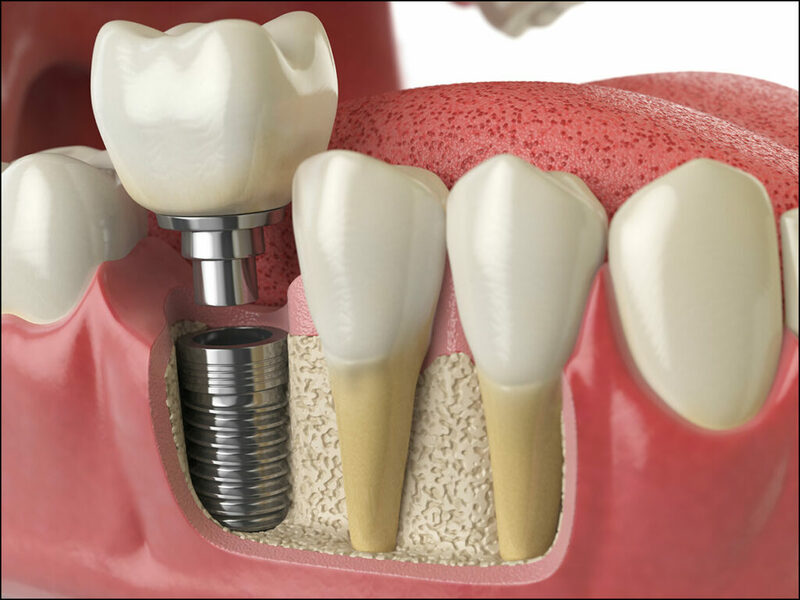 Following careful planning, the dental implant is positioned into the bone by the periodontist. 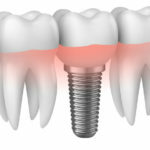 The dental implant is then given time to heal before it is used as an anchor for a crown, bridge or denture. Please feel free to contact the practice if you would like more information on dental implants. Following this examination the implantologist may require a CBCT 3-dimensional scan of the area where the dental implant is to be placed. The implantologist will use the scan to ensure there is enough width and height of bone present for your dental implant. In instances where there is not enough bone present for placement of the dental implant, patients may be required to have a bone grafting or sinus lift procedure first. For the CBCT scan, we will refer you to a specialist scanning centre for producing these 3-dimensional images. Please note, the scanning centre will charge you directly for this scan. The charge for a scan is currently between £95 and £150. * For patients having multiple dental implants, it may be necessary to first have a radiographic stent made prior to having the CBCT scan. The radiographic stent is worn during the CBCT scan. This provides the implantologist with detailed information about where best to locate the dental implants at the time of surgery. Following the assessment of the CBCT scan, the implantologist will then be able to provide you with a detailed estimate and plan for your dental implant treatment. The dental implant is inserted in to the bone. This is a relatively simple and minor surgical procedure, which is carried out under local anaesthesia. Following this there is a period of approximately two to three months of waiting whilst the bone is integrating around and securing the dental implant. Following dental implant integration, the dental implant can then be restored either with a crown, bridge or over-denture, as required. It is important to maintain good oral hygiene around the dental implant and regularly see the dental hygienist to maintain good oral health. We recommend patients see the implantologist once a year to review the status of their dental implant.